On Tuesday, Singaporean human rights activist Jolovan Wham was charged by prosecutors with three counts of holding unauthorised public assemblies, three counts of refusing to sign his statements to the police, and one count of vandalism. This drew swift condemnation from within and without Singapore. While most commentary focused on the absurdity of Singapore’s laws on public assemblies and the government’s willingness to suppress free expression, many also expressed puzzlement on the charge of vandalism. This charge stems from the second of Wham’s three peaceful protests. 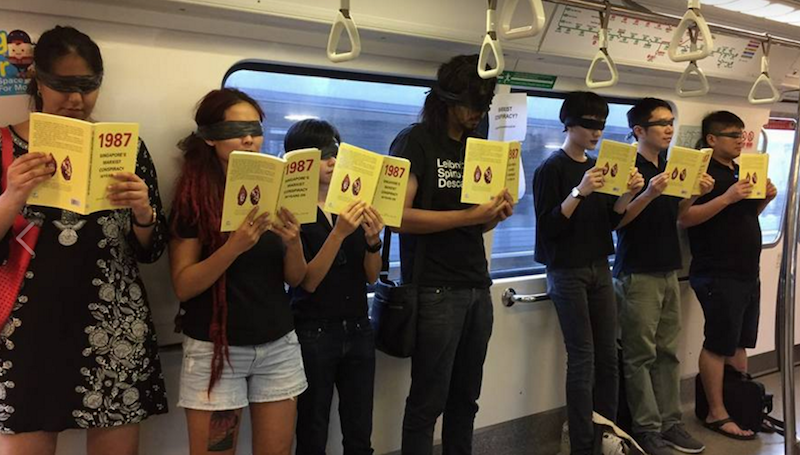 In June this year, Wham held a “silent protest” on the Singapore subway. That event marked the 30th anniversary of Operation Spectrum, where 22 social activists and volunteers were arrested and detained without trial, accused of an alleged Marxist plot to subvert the Singapore government. The detainees were deprived of sleep, kept in freezing rooms, physically assaulted and harshly interrogated. 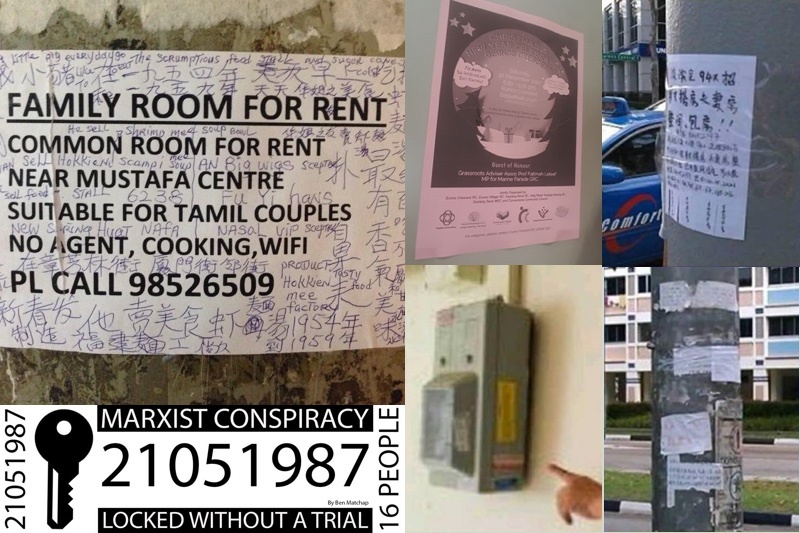 The Singapore government has never produced evidence linking them to any conspiracy, let alone any crime; more broadly, it has never produced evidence to substantiate any of the approximately 1,000 formal detentions without trial (and a further 1,000-1,500 informal detentions) it has made since the governing People’s Action Party (PAP) took power in 1959. As part of his protest, Wham taped two sheets of paper on the wall of a subway car. The sheets read “MARXIST CONSPIRACY?,” “#nodetentionwithouttrial”, and “JUSTICE FOR OPERATION SPECTRUM SURVIVORS”. There was no damage to the wall, but this led to the vandalism charge. After this was announced, Facebook users began sharing photos of indelible advertisement stickers (in particular, by locksmiths), leaflets advertising rooms to let, and other assorted posters, to which police have routinely turned a blind eye. What was most shocking to many was that the punishment was so disproportionate to the crime: under Singapore’s law, vandalism is punishable by a maximum fine of SG$2,000, up to three years in prison, and three to eight cane strokes, depending on the severity of the offence. Wham’s prosecution under the Vandalism Act, however, is no accident. The Punishment for Vandalism Act of 1966 (amended in 1970 to the Vandalism Act) was written deliberately to punish political dissidents, by demarcating certain expressions of political opinion as criminal and anti-national. This not only suppressed free speech, but consolidated the power of the state to decide what constitutes the ‘nation’. This was part of the broader British colonial strategy for control upon which the PAP expanded. Central to the Vandalism Act’s effectiveness was that it ignored the principle that the punishment should be commensurate to the crime, instead using excessive and humiliating punishment to break opposition political activists. By monopolising the meaning of the ‘nation’, the government can justify all manner of authoritarian action by simply defining its opposition as ‘anti-national’, and hence a threat to the ‘nation’ and the ‘people’. Central to the Vandalism Act’s effectiveness was that it ignored the principle that the punishment should be commensurate to the crime, instead using excessive and humiliating punishment to break opposition political activists. Outright coercion, including detaining opposition leaders through detention without trial, declaring lawful activities to be illegal, and deregistering or banning opposition trade unions and other organisations. It was hoped that this would provoke frustrated opposition activists into unlawful and unconstitutional action. The government could then use it to justify further and more direction action against them. Despite having severely crippled the political opposition, the opposition grassroots remained substantial. It continued to present alternative accounts and inconvenient facts about the PAP through its use of posters and other public displays. Furthermore, the PAP found that its use of detention without trial turned detainees into martyrs, winning them greater public affection and following (the same problem colonial authorities faced throughout their empires, including Gandhi, Sukarno, and in Singapore, Lim Chin Siong). The United Nations charter and the Bandung declaration recognised the right of the all people to self-determination and their own choice of government, and not to have one imposed on them. The Barisan’s position was that the Vietnamese were no exception, and that Singapore should not be enabling oppression. This situation intensified following the arrival of US troops into Singapore for the first time in April 1966. They had been serving in South Vietnam and arrived for rest and recreation leave. For a Singaporean public whose memories of the depredations of British colonialism, the Malayan Emergency, and Konfrontasi were still fresh, the prospect of being drawn into another conflict was extremely unwelcome. Likewise, a fundamental plank of the opposition Barisan Sosalis’ policy was to keep Singapore non-aligned, and avoid getting drawn into a Cold War conflict between the two imperialist blocs. They also recognised the Vietnam War as an anti-colonial conflict between a colonised people and a colonial power. The United Nations charter and the Bandung declaration recognised the right of the all people to self-determination and their own choice of government, and not to have one imposed on them. The Barisan’s position was that the Vietnamese were no exception, and that Singapore should not be enabling oppression. Consequently, the Barisan and left-wing trade unions launched a campaign against the presence of US troops in Singapore and against US military action in Vietnam. As they were denied public space in the form of rallies and coverage in the media, they put up posters in the middle of the night. This followed in a long tradition of protest, from Roman graffiti, to Martin Luther’s theses, to Chinese “Big Character Posters”, where posters are used to express dissent against an authoritarian power. 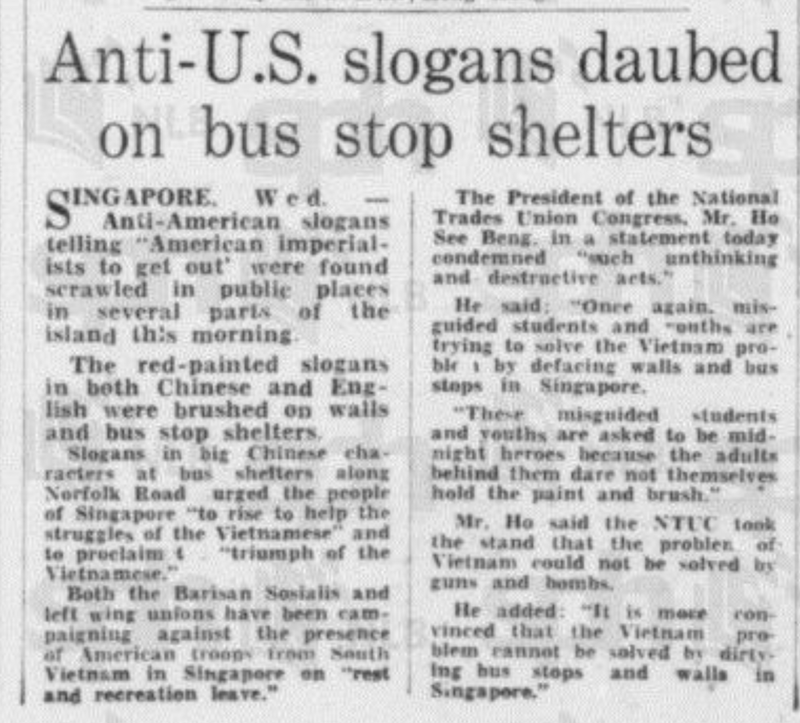 On 13 April 1966, Singapore awoke to find red anti-American slogans painted on bus-stops and walls. Subsequently, on the eve of Labour Day (1 May 1966), despite a heightened police presence, constant surveillance of opposition activists, and public announcements every half an hour warning people not to take part in rallies or demonstrations, anticolonial activists managed to put up “Yankee Go Home” posters on the streets leading to the American Embassy and around the offices of left-wing trade unions. The government prosecuted 23 men and boys for putting up the posters, but they ran into a legal obstacle. The 1906 Minor Offences Ordinance classified vandalism as a minor nuisance, with a maximum penalty of a $50 fine and a week in jail. It was non-seizable, so all the police could do was summon people to court. It was barely a deterrent to a determined democracy movement. The government tried to pre-empt the placing of posters. Three days before Singapore’s first National Day (9 August 1966), Internal Security Department (ISD) officers raided the Barisan Sosialis headquarters, seizing documents and posters. However, they knew that they could not stop every single instance of political posters this way; they needed to deter activists from placing posters. Ten days after the raid, on 16 August, the Punishment for Vandalism Bill had its first reading in Parliament. The government moved with great haste. A further ten days after its first reading, on 26 August, the Bill had its second and third readings and was passed into law. Third, they would smear these people by questioning their motives and spreading partial truths or even outright falsehoods about their actions, reducing these people to a subhuman “Other” for which the normal rules of law and civilisation need not apply. This created a narrative in which the government could argue it was compelled to pass more and more restrictive laws. In order to take effective action, it had to create laws which gave it the maximum discretion to exercise its power. This then created a large amount of arbitrary power which the government could wield selectively against its opponents. It is clear that what they were actually describing was not vandalism but legitimate dissent – and in particular, anti-colonial pro-democracy expression which, in the face of determined PAP attempts to obstruct and regulate legitimate political expression, had resorted to acts of disobedience in order to find space for expression. Accordingly, the introducer of the Bill, Minister of State for Defence Wee Toon Boon, described vandalism as being done by ‘anti-social and anti-national elements in the name of democracy’. Frequently repeating the term ‘anti-national’, Wee further emphasised that such ‘anti-national elements were ‘damaging or destroying public property which is provided for the benefit of the people’… these people find ‘cruel joy in destroying and damaging public property. In the interests of the nation, it is therefore necessary that the minority who cause damage should be dealt with severely.’ Prime Minister Lee Kuan Yew described vandalism as ‘a particularly vicious social misdemeanour, like taking a pot of paint and going to every bus stand and chalking up anti-American or anti-British or pro-Vietcong slogans’. In her analysis of the PAP’s argument for the law, legal scholar Jothie Rajah notes important sub-texts to the language used by the PAP. Firstly, it infantilised the people. “We have a society which, unfortunately, I think, understands only two things – the incentive and the deterrent,” said Lee, while Wee argued for caning as appropriate punishment by applying an analogy comparing the state and the people to a parent and a child. This is in line with the myth of vulnerability that is frequently repeated by the PAP – that the people are helpless, and vulnerable, and only the PAP can protect them. Second, sweeping assertions were used to attribute sinister motives to the people who committed vandalism. “It is common knowledge to Members that anti-national elements use children and other young persons to smear and mar public and private property,” declared Wee. This double smear described vandals as both ‘anti-national’ and as taking advantage of children. Wee and Minister of Law E. W. Barker also both drew a moral equivalence between those who permanently damaged property (emphasising damage which potentially placed lives at risk) and those who did non-permanent damage, such as writing slogans with delible ink or hanging up posters. therefore those who oppose the PAP also oppose the nation, seek to hurt the people, are subhuman, and must be punitively dealt with. From the PAP’s perspective, the answer was a resounding yes. Furthermore, as the people were helpless and vulnerable, their enemies had to be dealt with by the PAP through any means possible. Thus armed, the PAP proceeded to cast aside legal principle and precedent in the Punishment for Vandalism Act. The “vandal” is described as being motivated by political ideology, yet is categorised as a criminal, not a political activist. If the “vandal” were to be recognised as a political actor, then their right to dissent would have to be recognised. Instead, they are categorised as criminal, and the punishment of caning is mandated to deliberately humiliate. ‘[A] fine will not deter the type of criminal we are facing here. He is quite prepared to go to gaol, having defaced public buildings with red paint. Flaunting the values of his ideology, he is quite prepared to make a martyr of himself and go to gaol. He will not pay the fine and make a demonstration of his martyrdom. But if he knows he is going to get three of the best, I think he will lose a great deal of enthusiasm, because there is little glory attached to the rather humiliating experience of having to be caned. Second, the Bill departed from the general principle that a criminal conviction requires guilt in terms of both action and intention. Following on from his unsubstantiated assertion that ‘anti-national elements use children and other young persons to smear and mar public and private property’ Wee argued that the law had to take punitive action against those ‘actually responsible’. The Bill thus not only criminalised the commitment of an act of vandalism and any attempt to vandalise, but also, most crucially, it also criminalises anyone who ‘causes’ an act of vandalism to be done. Expanding the definition of vandalism so widely enabled to PAP to eliminate all other communication of information from our public space, allowing them to assert a monopoly over the information that we see and hear. “Word, slogan, caricature…poster, placard, advertisement… flag, bunting, banner.” The intent of the Bill was not about the damage caused by the act (as with most laws addressing vandalism around the world), but the attempt to communicate information. Expanding the definition of vandalism so widely enabled to PAP to eliminate all other communication of information from our public space, allowing them to assert a monopoly over the information that we see and hear. Thus, returning to Jolovan Wham, while it is unlikely that Wham will be subjected to caning for this offence, Wham could easily be charged with vandalism a second time in the future. Under the law, he does not even need to commit vandalism himself. As Wee made clear in Parliament in 1966, it merely needs to be shown that Wham ‘caused’ someone else to commit vandalism. Given the massive breadth of what can be considered vandalism in the city-state, and in light of what the Vandalism Act is intended to achieve, the possibility of Wham being charged with vandalism again cannot be ruled out. The public response to the charge of vandalism against Wham – the ridicule of the prosecutors and the sharing of photos of advertising posters and stickers – is understandable, but is based on a misunderstanding of the Vandalism Act. The Act was not meant to punish people who damage property. The Act was meant to give the PAP a monopoly over the information displayed in our public space; to conflate the ‘nation’ with the ‘PAP’; to criminalise and smear political opposition to the PAP as being subhuman and anti-national; to deter people who might dare exercise their constitutional right to free speech and political expression in opposition to the PAP; and, ultimately to humiliate through caning anyone who might persist in standing up to the PAP in public. In this regard, Jolovan Wham is exactly the type of person that the Vandalism Act is designed to target. The Online Citizen, “HK Activist Joshua Wong expresses solidarity with Jolovan Wham”, 2 December 2017, https://www.theonlinecitizen.com/2017/12/02/hk-activist-joshua-wong-expresses-solidarity-with-jolovan/. For a list for formal detentions, see https://fn8org.wordpress.com/advocacy/political-detainees-in-singapore-1950-2015/. “Formal detentions” refers here to those detained under section 8 of the Internal Security Act, which permits detentions (indefinitely renewable) up to 2 years. “Informal detentions” refers here to being held under section 74 of the Internal Security Act, which permits people to be held without a warrant by the Internal Security Department merely on suspicion of being a security risk for up to 28 days. Many such detainees were released after 28 days and immediately re-arrested when they stepped out of the ISD compound. For more on the criminalisation of legitimate politics, see Christopher Tremewan, The Political Economy of Social Control in Singapore (London: Macmillan, 1994), 194-199. See “Justifying Colonial Rule in Post-Colonial Singapore” for a broader discussion on how the PAP elaborated on British policies of control. Singapore Parliamentary Debates, vol. 25 col. 295, 26 August 1966. Jothie Rajah, Authoritarian Rule of Law: Legislation, Discourse, and Legitimacy in Singapore (Cambridge: Cambridge University Press, 2012), 65-80. Singapore Parliamentary Debates, vol. 25 col. 296, 26 August 1966. Singapore Parliamentary Debates, vol. 25 col. 293, 26 August 1966. “Justifying Colonial Rule in Post-Colonial Singapore”. Singapore Parliamentary Debates, vol. 25 col. 291, 26 August 1966. Singapore Parliamentary Debates, vol. 25 col. 298-99, 26 August 1966. Singapore Parliamentary Debates, vol. 25 col. 296-97, 26 August 1966. Vandalism Act (Cap. 341, 1985 Rev. Ed. Sing.) s.2. Singapore Parliamentary Debates, vol. 25 col. 296 and 298-99, 26 August 1966. Chris Lydgate, Lee’s Law: How Singapore Crushes Dissent. Victoria: Scribe Publications, 2003. Poh Soo Kai, Tan Kok Fang, and Hong Lysa, The 1963 Operation Coldstore in Singapore: Commemorating 50 Years. Petaling Jaya: SIRD and Pusat Sejarah Rakyat, 2013. Francis Seow, Beyond Suspicion? The Singapore Judiciary. Petaling Jaya: SIRD, 2006. ———, “The Malayan Vision of Lim Chin Siong: Unity, Non-violence, and Popular Sovereignty”, Inter-Asia Cultural Studies, 18:3 (2017), 391-413.